Also, I'm getting excited for the high water BIG wild Brown Trout action that comes with November and December. Again, this fishing is iffy, and I'm going to have to put a lot of hours in to pull of the kind of brilliance I did last year. That was a early winter to behold on my home water, with some of the best fish living in it making an appearance. Mainly Grandfather, the big 21 incher that I landed on Christmas Eve Day. The name of the game is not big streamers, as one would think, but heavily weighted stoneflies and worm patterns. Avoid San Juan Worms and go for the bigger pink latex patterns and my Lytle's Worm Fly. Of course, this type of cold weather fishing is excruciatingly unforgiving. This year I need to do it without waders. This is tolerable, I stay out of the water most winters anyway. The ones when I didn't I of course fell in. Either way I need to purchase a new pair of waders for fishing such chilly waters as the Farmington. I've been wildly obsessing of the area in the White Mountains I fished this spring. I'd like to do that trip again this spring, but focus entirely on fishing. It should make it a little less strenuous then the mineral collecting/getting lost/ carrying tons of gear and lumps of crystal studded granite that was done in June. Google Maps has been keeping me busily attentive for months, examining every little blue line and deep highland pond. Curious, does anyone know if the ponds in the Whites hold natives? Carp: I miss them. As much as I love the winter trout fishing serenity and can't wait to try a bit of ice fishing again, all the suggestions on youtube are carping videos. 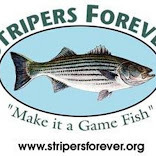 In The Riffle tying videos, the occasional Field and Stream "Hook Shots" featuring the species, and Carl and Alex Fishing (they have some good stuff, I recommend giving their channel a look see). I'll be dreaming of the warm morning when I will wade in and cast to a twenty pound tailing fish, to hear that real sing again. This routine continued until I had a few much bigger takes. I eventually succeeded in hooking the bellow fish. She ran circles in the pool and shook her head in attempt to avoid capture. Luckily for her I am strictly catch and release. Her dark flanks had evenly distributed spots, appearing like the late sunset sky. The rest of the week I will be too busy to fish, so it may be as much as ten days before I get any day trips. I'll try to fit in the occasional post anyway. Some truly wonderful stuff here. Trust me. Watch it through to the end. Early this morning I headed out to search for big browns on Mice and Streamers. The only fish I saw I at first presumed to be dead. It was heavily injured. Then I noticed It's gills were moving. I poked it with my rod tip and and it kicked. I gently lifted it from the water and dispatched it, then carefully examined it for the cause of injury. It appeared to be scarred by either talon or claw, and the wounds had become very infected. It was really a sad thing to see. I will not post the picture, as it was quite disgusting. It soon became evident that this was a hopeless activity, so I moved on to something more delicate and, well, more natural. 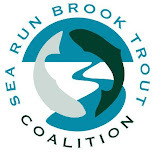 There are quite a few tributaries to this river, and most hold Native Brook Trout. These, no doubt, would be more fun. These fish were bigger then most in a stream this size, and although I hooked one, a 13+ inch male, I did not land it. The next time I'm in the area I will get him! I did land plenty of wonderful fish, all in very beautiful color. After exhausting that tributary's resources, I moved on to the next. There I found a holdover Rainbow and began casting to it with nymphs. On one of those casts a pretty male Native came over and chomped on it. Next cast I hooked into that Rainbow, and he gave quite a scrap before I landed him. After releasing him I moved on to the next trib, actually a trib of a trib, and caught one more Native to end the day. A concoction of yellow and red marabou, wood duck, bucktail, crystal flash, crystal flash, and black craft fur, trimmed. 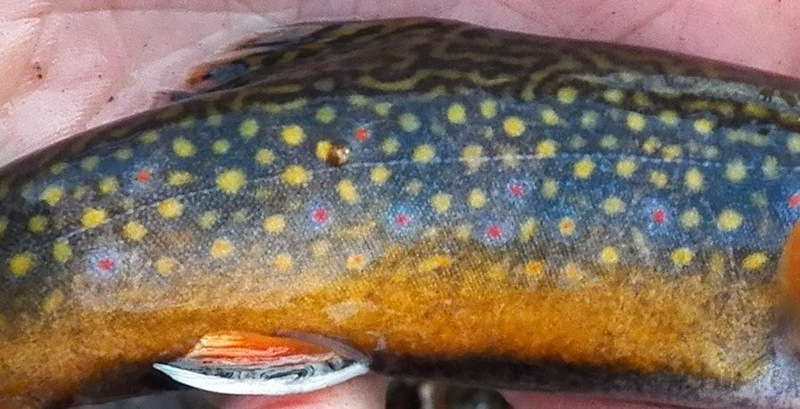 This afternoon I had a bit of time and a hankering for some "Specks", as the folks in Southern Appalachia call Brookies. The weather was not so pleasant: cloudy, windy, and with sputtering showers and mist. This, of course, does not stop me. I worked for some time with wet flies and buck tails, pulling some healthy char out of a small woodland brook. There was one that was larger then the others, but generally they were fairly small. Their colors did not match there diminutive size. Eventually I decided to try a dry fly, and a Royal Wulff was tied on. It took a few thoroughly speckled fish, one being only a yearling. On the way home, I stopped by another stream to see if it was inhabited. In a few casts I had my answer, and it was my last fish of the day.